I first picked up Fyodor Dostoevsky’s The Idiot in my local Barnes & Noble for the simple, superficial reason that I loved the cover design. Yet what drew me to read the a few pages and then ultimately purchase it that day was the intriguing premise promised by the back cover blurb: an innocent prince caught in a tangled web of corruption, secrets, and even murder. I was pulled in by the compelling juxtapositions between good and evil, moral and immoral, innocent and sinful, intelligent and idiotic. What are the distinguishing factors between the components of each opposing pair? And how oppositional are these pairs in actuality? Are they mutually exclusive or is there a blurry bridge that straddles both sides? The Prince is often ridiculed by his peers for being an “idiot,” yet in many ways he is the most intelligent one of them all. He is surrounded by a society that cares for nothing but money and social status, a society that tugs on all corners of his life in an attempt to mold him into something different. My heart ached for the Prince even as he made questionable decisions that could have easily been avoided with careful thought. In this way he is as frustrating as he is admirable. Many of the characters in The Idiot follow a similar pattern in terms of contradictory personalities. I was constantly being torn between pitying and opposing several characters, especially towards the end of the story. There are countless different levels and interpretations of meaning to this novel that I hardly know where to begin. One can view the story through a religious lens, asserting that the Prince is a Christ figure countered by the Satan-like figure of the murderer. Or one can talk about the role that Fate seems to play in the story. Does the Prince really deserve any of the misfortune that befalls him? There is also the complicated discussion of death in general, a topic that fuels many philosophical tangents and conversations in the novel. I would love to read this book in a class to be able to dissect some of these philosophical asides. I must have reread those few sentences a handful of times when I first came across them while reading. Using Columbus as an example of “failed” discovery is such a smart move because it’s something that a lot of people are familiar with and can easily relate to. However, the main issue I have with this novel is that I still feel as though I don’t fully understand everything that happened. Prior to reading The Idiot I had never read a novel translated from Russian before. I must admit that I think this had something to do with my increasing confusion as the narrative progressed. I’m sure that Russian names are a common source of frustration for English-speaking readers– at least, they certainly were for me as I attempted to keep all of their names straight in my mind. Of course, it didn’t help that I read this book over the course of several months. An extremely busy semester meant that I went weeks at a time without picking The Idiot back up again. To be honest, I’m surprised I was able to remember the basic events of the plot never mind the names of all of the characters. While it’s not necessarily fair to blame the novel for my confusion, it’s still important to acknowledge the issue because it nevertheless impacted my thoughts on The Idiot as a whole. 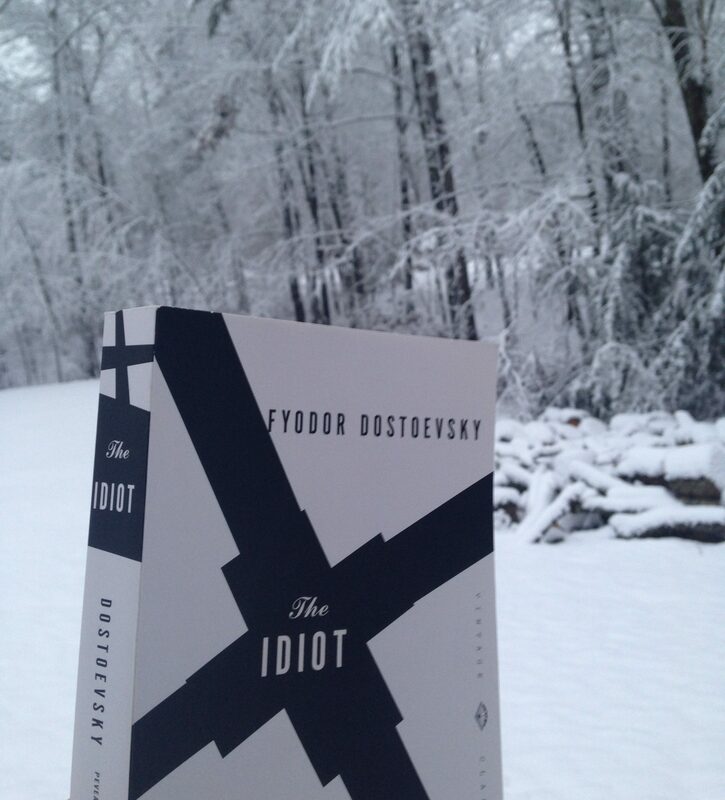 Overall, I’m glad I stumbled upon this striking edition of The Idiot while perusing the shelves of Barnes & Noble months ago because it has opened my eyes to the work of Dostoevsky. Though I’m left with mixed feelings about this particular novel, I feel like it’s something I might come back to in the future and try again. My Rating: :0) :0) :0) 3 out of 5. Would I recommend it to a friend? : Yes, along with a word of advice to read it without long periods of interruption. What are your thoughts on The Idiot? Would you recommend any of Dostoevsky’s other works? Let me know in the comments section below! Great review! It’s nice to find a modern, fresh review, for such a classic work. Thanks! Dostoevsky is on my list of to-read authors and this sounds like an interesting one to start with! I definitely feel the same about Russian names though – I’ve seen people make lists of the different names for characters so I might do that as it will probably help to keep things clearer in my mind! Keeping a list of names is a really good idea! I wish I had done that while reading this one. Recently I started reading Sartoris by William Faulkner and the first thing I did was create a family tree because there are SO MANY similar names! Okay but is no one commenting on how gorgeous those photos are, or? Anyways, this book looks pretty interesting, I’d definitely give it a go.Trying to keep track of names is hard, I always have to stop and think about who they’re talking about – and it’s even worse going back to a book several months after I started it.. Thanks so much!! ❤ I definitely should have made a list of characters as I read this book to keep them all straight… I'll have to remember that for the next Dostoevsky book I read! Thanks so much!!! ❤ This is definitely one of those classics that hurls you out if you neglect it for too long, but with proper attention it's really enjoyable! 🙂 Let me know what you think of it if you read it! Will read someday, though like you I admit, me too find russian names to remember and recollect a bit difficult even though it’s only in the setting of a book. I recommend Crime and Punishment. It was a real page turner and a rich read. I read The Brothers Karamosov too but didn’t like it as much. Thanks for the recommendation! I think Crime and Punishment will be the Dostoevsky that I tackle next. Great review! Don’t worry, I remember when I first read Anna Karenina the Russian naming system was very confusing, and it took me ages to sort everyone out. I’ve never read The Idiot, but I’ve read a little bit of Crime and Punishment and my impression was that Dostoevsky is definitely a tricky writer to keep up with, so I really admire the fact that you managed to make it through this novel, especially in the midst of all your uni-related work! I feel like he’s the sort of writer who does require quite a bit of re-reading. I definitely felt that way about Tolstoy! Thanks so much!! 🙂 It’s nice to know that I’m not the only one who struggles with Russian names. Yeah it was definitely tricky to read in the midst of a busy semester… next time I’ll be sure to read it over summer or a break when I know I’ll have enough free time to dedicate to it! I’ve wanted to read The Idiot for so long! That thing you talked about exploring polarising or opposite themes is very common in his work. I’d suggest Crime and Punishment by him, it’s one of my favorite books of all time, and I think it delves really deep into the question of morality, in the same way of exploring opposites! Great review!